On a sunny, 83-degree day in Camden, New Jersey, more than 300 kids were gathered at the North Camden Community Center for a free basketball clinic sponsored in part by the BIG3 basketball league. Cheerleaders from the South Jersey Fire cheer squad pumped up the crowd before groups of children from first to eighth grades took center court, participating in basketball warm-up drills. The older groups, ninth grade and up, did the same on the outside courts. In front of the community center, a black, unmarked sprinter van carrying former NBA forward/center Kenyon Martin and former NBA guard Andre Owens pulled up to the building. When the two entered, all activities temporarily ceased as a group of participants rushed to surround the ballers. From the looks on their faces, it was plain to see that some kids were unfamiliar with Martin and Owens, who were in their prime before some of them were conceived. On the other hand, there were looks of admiration from the older boys and girls who instantly recognized Martin — he was drafted No. 1 overall by the New Jersey Nets in 2000 and played four seasons for them — before they started toward him for pictures and autographs. This is Martin’s life post-NBA retirement. Not as grueling as an NBA schedule, but just the right amount of activity to keep him busy. Outside of appearances, Martin finds himself making up for the family time he lost during his 15 hectic seasons in the NBA. These days, Martin represents a league that is quickly becoming a favorite among fans of BIG3, the 3-on-3 basketball league created by Ice Cube. Martin serves as captain for team Trilogy, which includes players Al Harrington, Rashad McCants, James White, Dion Glover, Jannero Pargo and is coached by former Detroit Pistons Bad Boy Rick Mahorn. Kenyon Martin #4 of Trilogy drives to the basket against Reggie Evans #30 of Killer 3s during week one of the BIG3 three on three basketball league at Barclays Center on June 25, 2017 in New York City. According to Martin, Ice Cube contacted him directly to discuss his vision for the league and the mission behind it. It didn’t take long to persuade Martin to take up the offer to join other former players back on the court for competitive games. Before they hung up, Martin was sold. 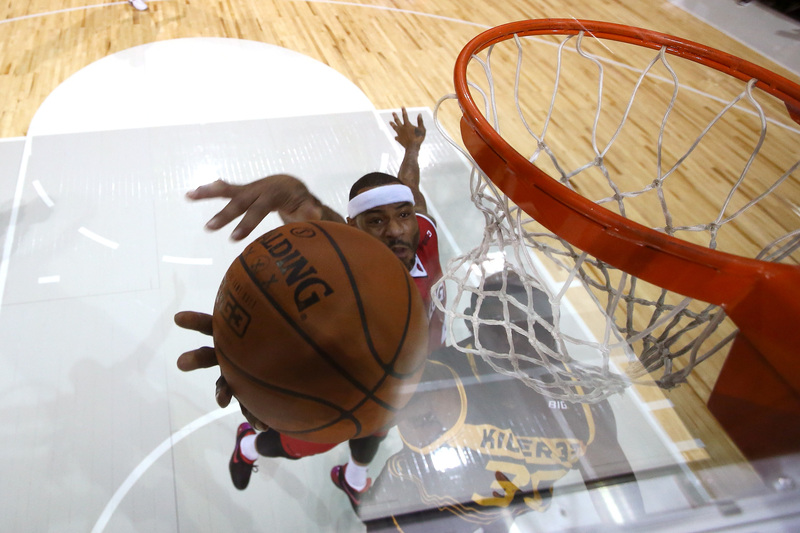 Before retirement, Martin was confident in his abilities to continue playing basketball and knew he still had what it took to help a team win, but he decided to make his 15th season his last go-round in the professional realm after noticing how much interest from NBA teams had dwindled. In July 2015, Martin made it official. Although the decision was easy for Martin, he hadn’t anticipated the rough transition from a professional basketball player to immediately finding a normalized lifestyle that worked for him. One thing Martin knew for sure was that defining himself outside of basketball wouldn’t be a problem. For Martin, basketball was the way he earned a living — it was never his identity. 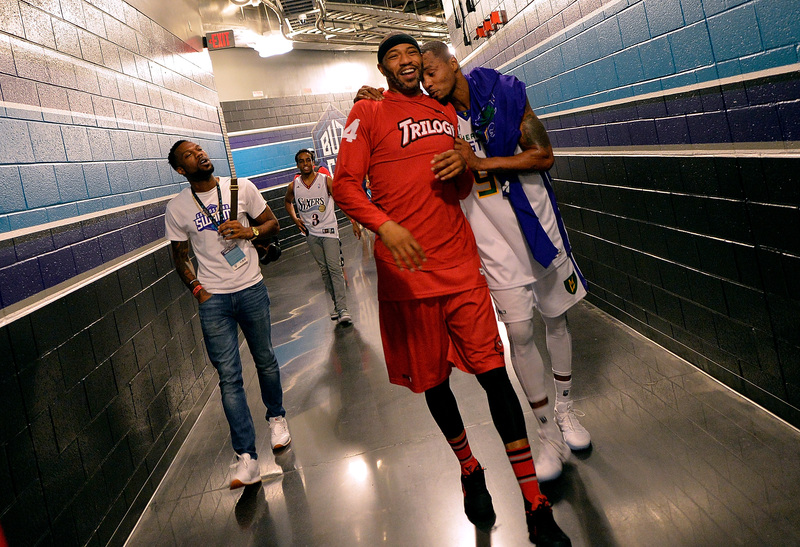 Kenyon Martin #4 of Trilogy and Rashard Lewis #9 of the 3 Headed Monsters walk off of the court together after their game during week two of the BIG3 three on three basketball league at Spectrum Center on July 2, 2017 in Charlotte, North Carolina. Yet, catching a glimpse of basketball games still sparked feelings of frustration. The thought of not being able to walk onto an NBA court was emotionally taxing, but Martin prioritized his time by setting aside moments during his day to “soul search” and found ways to center himself through his family. Out of his five kids — three girls and two boys, ages 16, 14, 12, 3 and 2 — Martin noticed the natural skills his son, Kenyon Martin Jr., possessed in the sport his father chose more than two decades ago. The high school sophomore and eldest of Martin’s kids is already on recruiters’ radar. When he’s not juggling family and basketball, Martin is spending time finding his next venture. Martin hasn’t been on the court since Week 1 of the BIG3’s schedule because of a pulled hamstring, an injury he’d never suffered throughout his collegiate or professional career, but he will be ready to roll for Week 5 in Chicago. The following stop, July 30 in Dallas, will be a homecoming of sorts for Martin, who grew up in Oak Cliff, an area of South Dallas.